Regnery Publishing, Inc., Washington, 2000. Why do many believe evolutionary theory is true? One is bombarded constantly with claims that all scientists believe in evolution; that science has demonstrated it; that evolution is based on empirical science. Many might remember ‘proofs’, which Dr Wells calls ‘Icons of Evolution’, learned in school or from popular science articles. The ten most common ‘icons’ used to back up evolution are reviewed and showed to be either fraudulent or irrelevant as evolutionary evidence. Amazingly, Wells documents that even some leading biology professors were unaware they were teaching nonsense. Had these false ‘icons’ never existed, perhaps evolutionary doctrine would not have taken such a hold. Wells is a man with indisputable intellectual gifts who does not bow to intimidation. Having been opposed to serving with the American armed forces in Vietnam, he chose jail rather than compromise his convictions. He then went on to earn a Doctorate in Theology (Yale) and a second Doctorate in Molecular and Cell biology (Berkeley). Wells sets the scene for this chapter by describing the 1920s Oparin/Haldane idea that lightning in the primitive atmosphere could have produced the chemical building blocks of life. The hypothesis remained untested until 1953, when University of Chicago graduate student Stanley Miller reported an experiment in which methane, ammonia, hydrogen and water (thought to be the components of the ‘primitive’ atmosphere) were mixed in a closed glass apparatus. The water was heated and the gases circulated past a high-voltage electric spark to simulate lightning. This provided the energy to break the chemical bonds of the compounds present, and the resulting free radicals combined to form a mixture of simple organic compounds, including trace quantities of some amino acids. Crucial to the success of the experiment was Miller’s water trap in which the amino acids generated could dissolve and thus be protected from subsequent destructive contact with the spark. But on the hypothesized primordial Earth with no oxygen (and therefore no ozone), the products would have been exposed to destructive ultraviolet rays. This is so even if they reached the oceans, because UV radiation can penetrate tens of metres of water. Per se, this experiment does not pose difficulties to the creationist. With the most astute intelligent guidance, such an experimental set-up, which generates a multitude of interfering organic acids and bases (plus racemic and biologically useless amino acids) cannot produce a single biologically relevant protein strand. To claim this experiment as evidence for evolution would be akin to allowing water to flow over a bed of coal, and upon identifying a little ink-like substance, claiming the Encyclopaedia Britannica was produced by natural, random processes. Oxygen, deliberately removed from Miller’s apparatus, destroys amino acids. But geological evidence indicates oxygen was always present on earth.1–7 It is produced by photolysis of water vapour in the atmosphere, where hydrogen escapes gravitation and oxygen thereby increases in concentration. Currently, the most probable early atmosphere is deemed by evolutionists to have consisted of water, carbon dioxide, nitrogen and hydrogen, a very different composition than used by Miller. Hydrogen would have been present in small concentrations at most, because it could escape Earth’s gravity; ammonia and methane would have been destroyed by ultraviolet light. In 1983, Miller reported that if carbon monoxide is added to the more realistic mixture, plus a large proportion of free hydrogen, then only glycine, the simplest amino acid, could be produced, and in trace amounts only. The experts know the experiments provide no support for an abiogenesis model. But nevertheless, biology textbooks and popular magazines like National Geographic continue to mislead the public into thinking that the Miller-Urey experiment is evidence for evolution.8 Wells concludes by citing one chemist’s acknowledgement that such publications are teaching ‘mythology rather than science’ (p. 27). Darwin believed characteristics acquired during an organism’s lifetime could be passed on to offspring, a concept proposed by Jean de Lamarck. Species would vary over vast periods of time until the divergence became great enough to produce new species. Separate phyla would eventually develop from a common ancestor. Wells points out a large number of inconsistencies between the Darwinian ‘tree of life’ and the fossil record. Plenty of suitable sedimentary deposits (i.e. in which organisms could have been preserved as fossils) exist within the late Precambrian and Cambrian strata. One cannot argue the ancestors might have not possessed preserved hard parts. In Africa and Australia, geologists have discovered sediments, dated by evolutionary conventions at over three billion years old, which contain fossilized single-celled organisms. The lack of intermediates where these should have been found lies in stark conflict with evolutionary predictions. Another difficulty is the existence of ‘living fossils’. Some of the fossilized ancestors are allegedly hundreds of millions of years old, essentially identical to those alive, and yet many have left no fossil evidence during this supposed vast interval. The lack of evolutionary change, in spite of a constantly changing physical and ecological environment, is glaring. Phylogenic trees based on DNA comparison contradict those derived from rRNA analysis. Protein phylogenies have merely added to the confusion. ‘A 1996 study using 88 protein sequences grouped rabbits with primates instead of rodents; a 1998 analysis of 13 genes in 19 animal species placed sea urchins among the chordates; and another 1998 study based on 12 proteins put cows closer to whales than to horses’ (p. 51). Wells, however, shows such claims are without foundation. In this chapter, Wells exposes the circular reasoning error in textbooks which define homology as similarity due to common ancestry, and then claim that homology is evidence for common ancestry. The bones in vertebrate limbs, whether bat, porpoise, horse or human, follow a similar pattern. Modern evolutionists use the word ‘homology’ for such similarities, but defined to mean inherited from a common ancestor. With this assumption already integral to the word’s meaning it is nonsense to then argue homology is evidence for evolution—it’s clearly a logical vicious circle. However, evolutionists are inconsistent in applying this argument, as many features, such as the camera eyes of octopi and vertebrates, with strong similarities (albeit superficial in this case), are not claimed to have arisen from a common ancestor. ‘The fact is that correspondence between homologous structures cannot be pressed back to similarity of position of the cells in the embryo, or of the parts of the egg out of which the structures are ultimately composed, or of developmental mechanisms by which they are formed’ (p. 71). ‘In salamanders, development of the digits proceeds in the opposite direction, from head to tail. The difference is so striking that some biologists have argued that the evolutionary history of salamanders must have been different from all other vertebrates, including frogs’ (p. 72). ‘Because homology implies community of descent from … a common ancestor it might be thought that genetics would provide the key to the problem of homology. This is where the worst shock of all is encountered … [because] characters controlled by identical genes are not necessarily homologous … [and] homologous structures need not be controlled by identical genes’ (p. 73). When homology is convenient as an evolutionary argument, it is used. Inconvenient observations, such as morphologically similar marsupials and mammals, get lamely brushed off as due to ‘convergence’. Wells highlights the flaw in the homology argument using this specific example: the gene Distal-less is involved in the development of appendages in organisms such as: mouse; spiny worm; butterfly; sea urchin (its limbs are tube feet underneath its body); and velvet worm (p. 75). The appendages are not homologous either in terms of structure nor by common ancestry. Darwin and others have reasoned that descendants along various evolutionary lineages would demonstrate similar embryonic morphologies during the earliest stages. Closely related organisms would show differences only during the latest stages, whereas distantly related ones should display ever widening differences as the embryo develops. Haeckel (1834–1919), a flamboyant German biologist, provided a series of drawings which conveniently demonstrated just this. These pictures appear even today in graduate-level biology textbooks, such as American Academy of Science president Bruce Alberts’ Molecular Biology of the Cell, with no statement that this evidence is a well-established blatant fraud, a shameless fake. Even Darwin, who called this his ‘strongest single class of facts’, was duped. Photographs of the embryos Haeckel selected demonstrate virtually no resemblance with his drawings. Additionally, Haeckel did not draw the first stage of growth, where closest resemblance was predicted, but selected precisely the stages where five (out of the seven) carefully selected vertebrate classes are least different. For the amphibian class the natural choice would have been a frog, which looks, however, very different than the other four organisms used, so a salamander was used as (uh) representative (ahem) for this class. Apparently all this was not good enough for him. ‘In some cases, Haeckel used the same woodcut to print embryos that were supposedly from different classes’ (p. 91). Although the embryos vary in size from less than 1 mm to almost 10 mm, Haeckel portrayed them the same size. Wells points out that the processes of cleavage (subdivision in many separate cells without overall growth) and gastrulation (movement and rearrangement of the cells to form organs and other structures) proceed before the point in time drawn by Haeckel. Here is where Darwin’s expectations should be tested, and there is ‘certainly not a pattern in which the earliest stages are the most similar and later stages are more different’ (p. 97). In fact, the evidence points clearly to unrelated lineages and not a common ancestor. Another myth is the claim human embryos go through a fish-like stage and display gill slits. These pharyngeal folds are not gills.14 Ironically, they’re not even gills in pharyngula-stage fish embryos, although they do develop into these later, ‘but in a reptile, mammal, or bird they develop into other structures entirely (such as the inner ear and parathyroid gland)’ (p. 107). In reptiles, mammals, and birds they never resemble gills, and what is observed are merely some parallel lines in the neck region. Professor Douglas Futuyma, author of the 1998 textbook Evolutionary Biology, responded in February 2000 via an internet forum to a critic who had accused him of lying by using Haeckel’s drawings as evidence for evolution. He admitted he had not been aware of Haeckel’s dishonesty, a rather staggering admission. It is important to always be sceptical of those endless, but transient ‘proofs’ for evolution. They reflect over-enthusiastic and selective use of data when it appears to support a pre-conceived evolutionary mind-set. Incidentally, Futuyma’s admission was not an example of ‘science’ correcting itself, but the result of a ‘creationist’ setting the record straight (p. 109). When Archaeopteryx was discovered in 1861 (two years after Darwin had published his Origin of Species), it was widely heralded as a ‘missing link’ predicted by Darwin’s theory—intermediate between reptiles and birds. However, as Wells points out, the position of Archaeopteryx as a transitional form is now very much in dispute, and in fact ‘its own ancestors are the subject of one of the most heated controversies in modern science’ (p. 112). Most paleontologists now agree this member of an extinct group of birds15 is not the ancestor of any group of modern birds, nor is it a link between reptiles and birds. Evolutionists conclude from cladistic studies (i.e. of shared common features) that bird-like dinosaurs would have lived in the Cretaceous period, which according to evolutionary dating methods was long after Archaeopteryx had supposedly become extinct. That leaves evolutionists back at square one: where are those countless missing links required by the theory, had birds evolved from reptiles? Wells takes great delight in describing modern evolutionists’ failed attempts to find fossil ancestors of birds. He gives a potted history of the infamous 1999 Archaeoraptor fraud. National Geographic had announced the discovery of this feathered dinosaur fossil in a blaze of publicity, but was left embarrassed when it was discovered to be a composite—a dinosaur tail glued to the body of a bird. Wells also outlines how the subsequent claims about Bambiraptor, proclaimed by paleontologists to be a ‘remarkable missing link between birds and dinosaurs’ were found to be groundless, as ‘nothing remotely resembling feathers was found with the fossil’ (p. 128). Wells also deals with the report that sequenced DNA supposedly extracted from a 65 million-year-old Triceratops resembled most closely that of birds. A little too closely, actually, being 100% identical to modern turkey DNA, even though Triceratops does not even belong to the dinosaur branch birds are claimed to have evolved from—ironically, birds are thought to have evolved from reptile-hipped dinosaurs rather than bird-hipped ones such as Triceratops. If this DNA had been only slightly contaminated (deliberately or accidentally) and from a better dinosaur candidate, the matter would have been declared settled. Wells’ clever refutation of all the ‘missing link’ bird ancestor claims raise the following obvious consideration: the fossil record, with its absence of millions of generations of intermediates, justifies questioning his frequent references to ‘millions of years’. If, as I believe, merely thousands of years are involved then the data is statistically representative of the earth’s biological history. The ‘classic’ textbook example of natural selection says that most peppered moths were light-coloured in the early 1800s. But with the Industrial Revolution, the proportion of ‘melanic’, or dark-coloured, increased near heavily polluted cities because they could now camouflage themselves on soot-covered tree trunks. As pollution reduction measures were introduced, the proportions reversed themselves. This has been used for years as the best example of natural selection in the wild. During the 1950s Bernard Kettlewell released several hundred of both moth varieties onto polluted tree trunks and watched birds pick off the helpless creatures. He determined that percent-wise, about twice as many of the darker variety had survived. These results were confirmed by reversing the experiment using unpolluted trees the next time. These experiments tell us nothing about where moths’ alternative colors come from, of course, let alone how a moth could have evolved from a non-moth. And the ‘facts’ of the story, repeated in countless biology textbooks, are badly flawed. Moths in the wild are now known to be nocturnal fliers and virtually never remain exposed on tree trunks, but rather high in the trees on the underside of small branches where birds rarely seem to find them. Had the theory been correct, the light coloured varieties would have long since disappeared from heavily polluted areas such as Manchester, England. But this never happened. In regions with little industrial pollution, where the light-coloured ‘typicals’ seem better camouflaged, the melanic proportion unexpectedly reached 80%. And below the latitude 52°N melanism increased after pollution control measures were introduced. Furthermore, a decrease in pollution levels was matched by an increase in the proportion of melanics north of London but a decrease in the south. Although melanics seem better camouflaged in south Wales, they make up only about 20% of the population. Although decreasing pollution allowed the light coloured lichens to cover tree trunks again, the increase in proportion of typicals preceded lichen growth, i.e. the hider recovered before the hiding places. Finally, a decline of the melanic proportion in the United States was independent of changes in the lichen cover. Several factors may be involved here. R.C. Steward collected data from 165 sites in Britain and found a correlation between moth proportions and concentration of sulphur dioxide, which is a pollutant transported by air. What is disturbing in this matter is that the photographs, showing camouflaged moths on tree trunks, found in virtually all standard biology textbooks, have been staged. Dead moths had been glued to tree trunks, or moths released in desired positions during daylight, when they are torpid and remain where they land. University of Chicago evolutionary biologist Jerry Coyne discovered to his dismay the flaws in what he called this classical ‘prize horse in our stable of examples’ of evolution only in 1998. Badly flawed experiments such as these continue to be reported uncritically merely because the evidence for evolutionary notions is in such short supply. Fourteen species of finches were found on the GalÃ¡pagos Islands, distinguished mainly by beaks adapted to different foods. We don’t know the genetic basis of these differences, and most creationists view this as an example of genetic variety present in an ancestor having been fragmented into sub-groups over time. Such changes remain within the original created kinds. Peter and Rosemary Grant studied these finches in the 1970s. In 1977 a severe drought reduced the population to 15% of its former size on the small island of Daphne Major. It was determined that the average beak depth of medium ground finches increased about 5%. They attributed this to the ability of such birds to crack open the few remaining harder seeds once the softer ones had been eaten.16 They concluded it would take merely 20 such selection events to transform the medium ground finch into another species, easily within 200 to 2,000 years. Wells points out that, ‘After the 1982–1983 El NiÃ±o, with food once again plentiful, the average beak size in medium ground finches returned to its previous value’ (p. 168). This oscillation in population proportion does not justify extrapolations to explain how the 14 species arose. After this El Niño, several finch species on one island were found to be producing hybrids, and these were doing better than the parental species. The Grants concluded that if this process continued these species would merge completely. This further compounds the difficulty in explaining how a slow process of divergence, based on mutations and randomly fluctuating external conditions, could explain the origin of these species. As a prize example of creating new species by natural selection, these finches leave very much to be desired. The data does not justify the view that natural selection would be able to produce ‘macro-evolutionary’ new structures and biological functions. Wells criticizes a 1999 USA National Academy of Sciences booklet which describes how the Grants and their colleagues showed ‘that a single year of drought on the island can drive evolutionary changes in the finches’. But the booklet did not even mention that the selection was reversed after the drought—there was no evolution (p. 174). ‘Berkeley law professor and Darwin critic Phillip E. Johnson wrote in the Wall Street Journal in 1999: “When our leading scientists have to resort to the sort of distortion that would land a stock promoter in jail, you know they are in trouble”’ (p. 175). Geneticist Ed Lewis showed that three strains of laboratory mutant fruit flies could be interbred to produce four winged flies. The balancers or ‘halteres’ required for flight stability in the third thoracic segment were replaced by two new wings. The evolution-oriented textbooks use this to claim random mutations provide some useful changes on occasion, which natural selection then favours. The exceeding unlikelihood of three such mutations, introduced in the laboratory, is never mentioned. More serious is that no muscles are attached to these wings and a hopelessly non-aerodynamic creature results, which could never survive nor mate in free nature. Duplicate organs may be interesting, but what is needed is evidence that novel functionality or organs can develop by random and unguided processes. Ultrabithorax is a huge and very complex gene which is composed of several subunits, ‘most of which are involved in regulating when and where the gene is turned on in the embryo’ (p. 188). It regulates an integrated network of genes responsible for haltere development. ‘It is this entire hierarchy, and not just one gene, that had to evolve in order to convert wings into halteres’ (p. 188). The odds of a single, new gene arising by chance mutations is statistically negligible, far less a complete integrated network. Ultrabithorax in a normal fruit fly is turned on in the third thoracic segment, allowing the necessary halteres to be produced instead of wings. By destroying the normal function, new non-functional wings are generated. Destruction of a genetic network cannot be construed as evidence for its evolution by chance any more than destruction of a house by earthquakes would demonstrate these had built the house in the first place. ‘German geneticists Christian Nüsslein-Volhard and Eric Wieschaus were using a technique called "saturation mutagenesis" to search for every possible mutation involved in fruit fly development … . Their Herculean efforts earned them a Nobel Prize (which they shared with Lewis), but they did not turn up a single morphological mutation that would benefit a fly in the wild’ (p. 190). Similar mutagenesis experiments on a tiny worm and on zebrafish have also failed to produce any beneficial mutations. It seems Prof. Behe’s concept of ‘irreducible complexity’18 provides insight into where the problem lies: intra- and inter-cellular biological processes invariably require that multiple components work together properly before any useful function is possible. The odds of these all falling into place by chance at the right time, place and concentration is just overwhelmingly small, even under accelerated and artificial laboratory conditions. Rather than simply calling this icon ‘horse evolution’ Wells has chosen instead to tackle the materialistic evolutionists’ position that the branching-tree pattern of horse fossils refutes the idea that evolution was ‘directed’. (Most evolutionists who were Darwin’s contemporaries apparently believed that evolution was ‘directed’. Wells explains that ‘Some regarded human beings as the divinely pre-ordained goal of the evolutionary process’ (p. 197)). The problem here is that this chapter is marred not only by Wells’s neglect to quash the standard view of the fossil record (as in Icons 2 and 5), but also because in places it appears (at least, by implication) as though Wells might be defending (supernaturally) ‘directed evolution’. In saying that Darwin was in error because he rejected any possibility of ‘directed evolution’ on philosophical grounds rather than on empirical evidence, Wells goes uncomfortably close to espousing ‘theistic evolution’ as the alternative to ‘undirected evolution’. The most interesting parts of this chapter are where Wells confronts evolutionists with the problem that their horse evolution model is contradicted by the fossil record. ‘For example, the trend toward larger size was not seen in all of the extinct side-branches, some of which actually reversed direction and became smaller’ (p. 199). Also, ‘Miohippus actually appears in the fossil record before Mesohippus, though it persists after it’ (p. 199). In the same way that dogs, dingoes, wolves, coyotes, and so on, descended from a single dog kind after the Flood, so too could all the various horse varieties, zebras, donkeys, etc., have originated from an original horse kind. Like Darwin’s finches, it is probable significant genetic variety had been designed in the original animal ‘kinds’, able to be fragmented quickly among descendants. There is simply no need to explain variation as the result of random mutations creating novelty, acted on by natural selection. For over 40 years the Piltdown fraud had persuaded the leading scientists a missing link had confirmed man’s descent from ape-like ancestors. The skull belonged to a true human and the jaw fragment from a modern orang-utan. It turned out that the latter had been chemically treated to make it look like a fossil and its teeth had been deliberately filed down to make them look human. It took that long to discover this none-too-elaborate hoax because evolutionists thought they had evidence which they very much wished to believe. Fossil fragments of various human races and monkeys have been found, in different locations and strata. Some appear to be extinct apes. The difficulty arises due to preconceptions, allowing the fragments to be reconstructed in many ways. Several palaeontologists recall discussing how drastically different the famous Kenyan ‘Skull 1470’ could be made to look, depending on where one chose to place the jaw with respect to the rest of the skull. The subjectivity involved can be illustrated by four artist’s rendering of a female Homo habilis figure from casts of seven fossil bones, requested by National Geographic.20 It is apparent from the results that one could easily fit such a reconstruction anywhere in the ape-to-human sequence. There is considerable interpretative freedom in the absence of qualitative and quantitative evidence. Dates are frequently re-evaluated. One can consider how diverse pygmies and two-meter-tall weight lifters are today. Include the effects of disease; harsh environmental conditions; jaw-muscle—demanding diets, and greater genetic variety in the past, to appreciate how subjectively the handful of fragments could be interpreted. In a closing chapter entitled ‘Science or Myth?’, Wells discusses the fact that in America billions of taxpayer dollars are being spent annually without their consent to finance evolutionary origins research. Funds from NASA, the NIH (National Institute of Health) and NSF (National Science Foundation) fund research projects headed up by those already committed to an evolutionary mind-set21,22 and the resulting papers are used to gain professorship tenures. Students must buy evolution-oriented textbooks and attend schools and universities where only evolution is taught, presented as ‘science’, as ‘established fact’. If all biology teachers and students were to digest a book like this, or Dr Jonathan Sarfati’s Refuting Evolution,15 and agree to throw out the 10 icons of evolution just examined, very little would be left to justify the claims we are bombarded with daily: ‘the evidence for evolution is overwhelming’; ‘no serious scientist questions the truth of evolution anymore’; ‘the creationists will destroy modern society with their opposition to science’, etc. Ironically, it is common to meet agnostics and atheists in countries like China and France who state candidly they are not willing to consider the possibility of a Creator, but acknowledge the materialist theories being taught in schools and universities don’t work. Wells correctly recognises there is a battle going on, to control what is acceptable material for discussion in the schools; to manipulate who gets access to research funds; and who gets to join the ‘inside club’ of those claiming to speak with the authority of science to inform society where we come from and the role of humans in nature. Thaxton, C.B., Bradley, W.L. and Olsen, R.L., The Mystery of Life’s Origin: Reassessing Current Theories, Lewis and Stanley, Dallas, Chapter 5, 1984. Return to text. Monastersky, R., The rise of life on Earth, National Geographic 193(3):54–81, March 1998. Return to text. Simpson, G.G., Tempo and Mode in Evolution, Columbia University Press, New York, pp. 105–106, 1944. Return to text. Denton, M., Evolution: A Theory in Crisis, Adler & Adler, Marland, Chap. 12, 1986. Return to text. Proceedings of the National Academy of Sciences 95:11804; cited in ‘The odd couple’, New Scientist 160(2154):23, 1998. Return to text. Before and during World War II, virtually everyone in Germany claimed the evidence for the superiority of the ‘Aryan race’ was established and beyond dispute. For military purposes Hitler calculated the average German soldier to be worth three Slavic ones. It is not the evidence which was overwhelming but the mind-set and Weltanschauung (philosophy of life) which prevented consideration of alternative viewpoints. Return to text. One sceptic writes, ‘In Chapter 3 [Icon 2: Darwin’s tree of life], Wells readily accepts 3 billion year old bacteria fossils. So the question is, how does one explain the transition from the first single bacterial cells of more than 3,500,000,000 years ago to the abundance of life we see around us today?’ The sceptical reviewer derides Wells for not offering a credible alternative explanation ‘to explain HOW life has changed with time.’ Interestingly, the sceptic tacitly acknowledges the consistency in the position held by young-earth creationists: ‘At least the Creationists offer some sort of Biblical creation scenario, in which the world was created 10,000 years ago, and claim that much of what we see in the fossil record is the result of a global Genesis flood. But all that is offered in “Icons of Evolution” is an attack on evolution, with no alternative explicitly mentioned, although the idea of humans being “Created with a purpose” [by an Intelligent Designer Someone] is brought up in the conclusion.’ Icons of Evolution: Legitimate questions of evolution, or stealth creationism?, <http://www.cbs.dtu.dk/dave/IconsReview.html>, 22 January 2001. Return to text. ReMine, W.J., The Biotic Message, St. Paul Science, St. Paul, p. 381, 1993 (see online review ). Return to text. Sarfati, J., Refuting Evolution: A Response to the National Academy of Sciences’ Teaching About Evolution and the Nature of Science, Chap. 4, Master Books, USA, 1999. Return to text. Note that a 5% decrease in beak size could also easily be interpreted with a natural selection ‘just so’ story. One could argue that half starved and weakened birds could hardly afford any needless waste of energy, and flipping around heavier beaks thousands of times every day would have been selected against. Or perhaps the larger specimens had greedily continued to select the more appetising, larger seeds, found in smaller abundance whereas the smaller birds collected energy more rapidly with the more abundant smaller seeds. As food ran short, the larger birds starved selectively. Return to text. Wieland, C., ‘Darwin’s finches: evidence for rapid post-Flood adaptation , Creation 14(3):22–23, 1992; Review of J. Weiner’s Book: The Beak of the Finch: Evolution in Real Time, Journal of Creation 9(1):21–24, 1995. Return to text. Behe, M.J., Darwin’s Black Box: The Biochemical Challenge to Evolution, Touchstone, NY, 1996. Return to text. Sarfati, J., The non-evolution of the horse: Special creation or evolved rock badger?, Creation 21(3):28–31, 1999. Return to text. National Geographic 197(3):140, March 2000. The heads ranged from definitely ape to obviously human. The female’s arm structure ranged from matchstick thin to a pair which would terrify a modern male body-builder. Return to text. Christian researchers struggling for research funds are often stunned to see how evolutionists are being funded from public sources to attack Biblical claims and interpret scientific data in a one-sided materialist manner. By pretending evolution = science, work time and resources are also being abused. Return to text. But many times, creationists are not even allowed the normal courtesy of a right of reply. Scientific American refused to allow Phillip Johnson to defend himself against a vindictive and petty review by the atheistic Marxist, Stephen Jay Gould. So Johnson published ‘Response to Gould’ on the Web site of Access Research Network, which promotes Intelligent Design. In Australia, a well-known humanist and vexatious anti-creationist wrote a diatribe of illogicalities against creationists in Australasian Science, and the editor refused to publish a response. So AiG posted this response, and even then the editor attempted to bully AiG into removing it, based on a misunderstanding of copyright law. I applaud journals and evolutionists willing to examine controversial issues openly before the scientific community, but most of our responses are brushed off with statements like, ‘very interesting, but not of enough broad interest to merit printing’ (and that’s if they bother to feign politeness!). Return to text. Sceptics know that Wells is not a Biblical (‘young-earth’) creationist but believes in an ‘old earth’. 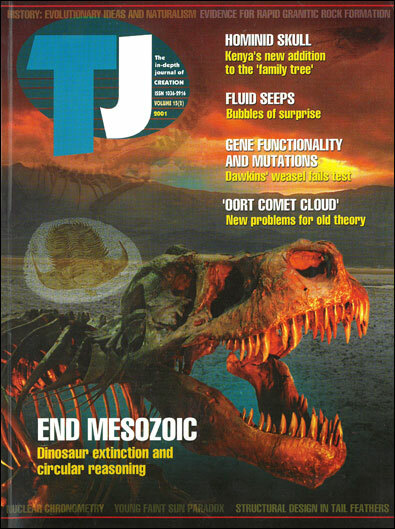 Reviews: Icons of Evolution by Jonathan Wells, <http:www.don-lindsay-archive.org/creation/icons_of_evolution.html>, 22 January 2001. Return to text. Wells is a Reverend in the Unification Church and remains committed to Unification doctrine—Unification Sermons and Talks by Reverends [sic] Wells, 22 January 2001. Dr Jonathan Wells returns to UTS [Unification Theological Seminary], 22 January 2001. In reply to claims that all Intelligent Design theorists are biased by Christianity, Wells has pointed out that he himself is not a Christian. Return to text.